I have begun working on the inside of the cottage even though I have not completed the outside of the cottage. I have too many projects. I really do. Anyhow, now this interior work is turning out to be daunting task. As time went on and the property passed on to others it appears less care and attention were given to the cottage. I cannot say for certain what went on in there, but I think someone lived in it for a time and then, perhaps, unruly heathen children were let lose upon it where they graffitied the walls, ceiling and punched holes. It’s a complete disaster. Some repairs were attempted in the past, but the work is awful and will need to be redone. I believe the previous owner attempted to cover up much of the graffiti with primer before placing the property on the market. A wise decision considering what I can still see and what is bleeding through the primer! My plan for the space has been to turn it in to my office and studio space. I used to paint and often think I would like to return to it, so I need a space for such activity. When my mother moved in I gave her what was being used as my office and the master bedroom, so she would have a small, proper living space. In doing so I lost my office space, and everything has been in boxes since then. It will be nice to have my own space again. Unfortunately, my budget has recently been reduced and so I have had to scale back the grand plan. Currently I have started with the walls. I have thousands of big and small holes to fill, which hasn’t been too difficult so far. On one side of the room there are some large holes that someone had cut. I believe it was their intention to piece in new wallboard, but never finished so I will attempt this myself. 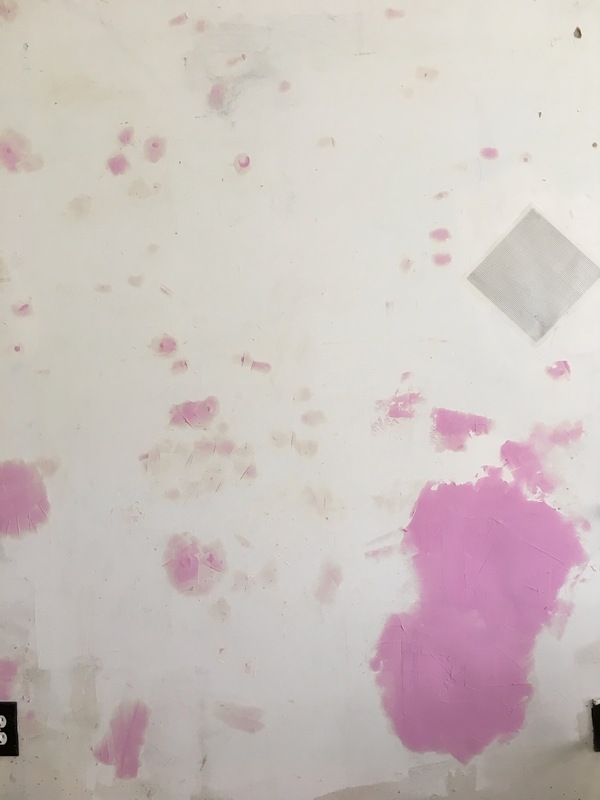 The wall filler is pink at first and then turns white when completely dry. Once the walls are completed I intend on removing the fluorescent light fixtures in the ceiling and filling in holes left behind. I will reuse the electric lines in the attic to wire in new track lighting. I poked my head up in the attic for the first time and was dismayed at the amount of stuff someone left up there! Especially since some of it is laying on top of the light fixtures I need to remove. The other problem is the attic space is more or less a crawl space. I literally will have to crawl on my stomach over the rafters and insulation to be able to move stuff out of the way and remove the light fixtures. I am not looking forward to this since it’s also extremely hot up there. 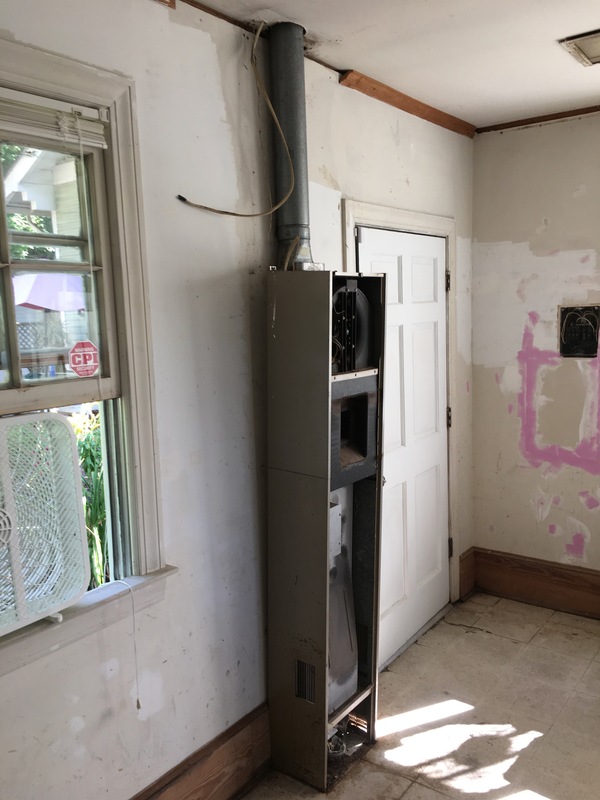 I started to remove the broken old gas heater but ran into a wee problem. I cannot seem to be able to budge the connector to the gas line! After quite a bit of tinkering I figure I best call the gas company and ask them to do it for the fear of blowing up. The next step will be to prime the ceiling, walls and windows and then paint. The final project will be laying a new floor, which should be interesting because I definitely have never done that before. I found a good deal on flooring last week and since my budget is so tight I went ahead and ordered the materials. 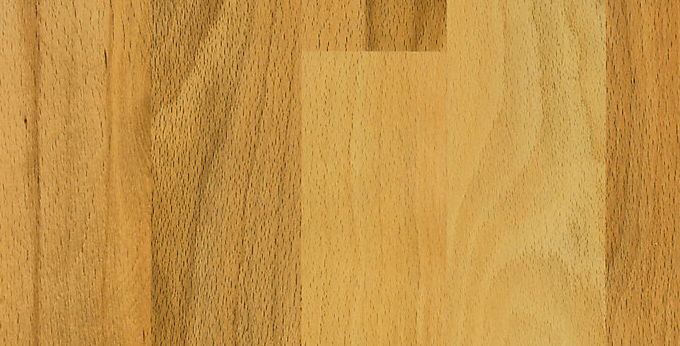 New flooring material is an American Beech laminate. As you can see there is much to do, and all of this does not take into account I still need to complete painting the exterior.